Kayaking directly under the historic Charles Bridge in Prague, Czech Republic. Prague, the capital of the Czech Republic is a very interesting and picturesque city to explore. After traversing it’s famous Charles Bridge on foot several times and dodging the multitudes of tourists, I yearned to see it from a different angle, without all the people. Prague is bisected by the Vltava (Moldau) river which runs through the center of the city from south to north and has been it’s life blood for hundreds of years. There are several sets of weirs and locks for ship traffic, and you can also rent pedal boats to relax in the small confines that some of these river control structures create. As a sea kayaker, I wanted to do a longer and more challenging trip than what the typical tourist options on the water could provide. Tourists-eye view from the Charles Bridge looking south. Steamers, weirs and pedal boats mingle in the spaces created by the river control structures. My route from the kayak shop at bottom up to the second lock at the top, and back was about 7 to 8 miles round trip! I became determined to kayak the stretch of the river which would take me past the most interesting historical sights, and after some research it all came down to the launch spot (put-in) and the obstacle of just one weir and/or lock that I would have to either go over, through or portage around. Still more research and footwork was needed to scout out possible portage options, none of which panned out due to fencing and restricted areas. Eventually I got a phone number for the river lock keeper and was happy to learn that yes, kayaks are allowed to go through along with the rest of the river traffic! Next I found the ideal put-in location on Císařská louka, an island just a few miles to the south. The good folks there at Vodácký Ráj kayak shop hooked me up with a Prijon Barracuda sea kayak that was a decent fit for me, and the fastest boat they had available. Paddling the Vltava river, past the beautiful green tree lined stretch that is Císařská louka. It’s a long sliver of an island seen on the far right and top here. It felt really good to get out on the water again after not paddling for several weeks!! I should add another exclamation point! The kayak felt kinda stiff, with somewhat tender secondary stability, and although a quick boat, not very maneuverable. This was further compounded by the fact that I wasn’t able to adjust the foot rests and thus unable to use them. Still, this is flat water, so it wasn’t that big of a deal, but it made turning the boat a little harder. Teen K1 paddler with wing paddle in perfect form and Vyšehrad in the background. Soon I was passed by a couple of girls in K1 training boats, in perfect form, with wing paddles (which sadly I was unable to rent).. competitive paddling is very popular here, and I also saw several rowing shells and dragon boats too! Just on my right the were the ruins of Vyšehrad, standing on top of a cliff for over a thousand years, silently watching over Prague through the centuries! Chilling with swans in the heart of Prague, kayaking on the Vltava river. After going under a rail bridge, there was a shallow embankment on the west side where I could see people feeding the many swans that live on the river. I decided to get out and feed myself! Swans live along the banks of the Vltava river in Prague. Swans are very majestic, beautiful and smart birds! Prague has swans of all shapes and sizes! In June of 2011, this pink Soviet tank – originally part of a monument to WWII (liberating) Soviet tank crews was on display on the Vltava river for a different reason. Painted pink, and sporting a middle finger salute by famous Czech artist David Černý, this tank was on a barge commemorating 20 years since the last Soviet troops pulled out of (then) Czechoslovakia in 1991. Before that, Soviet troops had already been in place for 23 years of occupation following the 1968 “Prague Spring” uprising! The guys in the photo below made it OK going over the weirs, but there is a very real risk to this! The current is strong and there are potentially submerged objects, along with likely “backwash” hydraulic counter currents that could entrap and drown a person. I elected to go through the river lock chamber instead of running this stretch. I do NOT recommend anyone going over the weir and this is one of the things to look out for if you rent one of the tourist pedal boats! A couple of paddlers in an inflatable going downriver over the weir just ahead of the Charles Bridge. For safety this option is NOT recommended! Next I realized that I was just in time to go through the downstream lock and waved at the tourist steamers as they positioned inside the lock chamber. As luck would have it, a small service skiff was going through next to me, so I was able to hang out with them for the 20 mins or so that it took to drain the lock. Entering the river lock, holding on to work skiff next to me. Finally, I found myself paddling under the Charles Bridge, dating back to 1357, and built to replace an earlier bridge which collapsed in a flood 15 years before that. It was quite the surreal experience, along with the other sights in the distance, such as the Prague Castle, Old Town Bridge Tower, National Theatre, etc.. a very nice moment indeed!! Kayaking under the historic Charles Bridge panorama with a few historical sights! The bridge, Saint Francis of Assisi Church, Old Town Bridge Tower, the Bedřich Smetana Museum and the Charles Bridge Palace all on the right. Take a moment to admire the panoramic view above and listen to the accompanying soundtrack for Vltava below! Composed by famed 19th century musical genius, composer and Czech nationalist Bedřich Smetana, it’s one of his series of six beautiful symphonic poems entitled “Má vlast”. The distinctive motif and progression make it his most famous piece and lasting contribution to classical music! Going under the Charles Bridge in a kayak. Beautiful sights kayaking through the Old Town of Prague! These fun pedal and row boats can be rented from several places if you just want to get out on the water to relax and not worry about going through any locks. You will however be confined to a much smaller area of the river, so do keep an eye out for the edge of the weir! I hoped to get in a little bit of a workout, and thus paddled quickly with the current, surfing the small wakes and eddies for a couple more miles, under a few more bridges to the head of the next lock, and in sight of a totally different section of town. After some chill time, and observing the many tourist steamers and other activity, it was time to turn around. Going upstream wasn’t too hard, only somewhat hampered by the (relatively) heavy plastic touring paddle (to what I’m used to). Again going under Charles Bridge, now with clouds building up, I caught a few sprinkles. Charles Bridge and the Prague Castle. This is the same work crew I was hanging out with inside the river lock. There’s bridges, bridges, and more bridges! Veering off to the west bank of the river back into the lock, I paddled briskly to make it before the gates closed – which they did, literally just in front of me! I’d hazzard to guess the lock keeper had to see me, still he closed it, maybe he had no choice. I even called him up, but he refused to re-open it just seconds after closing. What a shame as this meant that I would now have to wait for well over an hour for the whole cycle to complete from this side!! The keeper was telling me to portage over, which I could see, but as I had previously scouted out the other end it wouldn’t help me. My impression is that in the past there was a portage there, but that is now obstructed by new fencing right along a fancy restaurant. The outlet there is also a sketchy 10 feet from the edge of the weir which must make for an interesting re-entry into the current! In any case, I was able to get out onto an adjacent skiff, pull the kayak out and snack/stretch out for a while and watch the folks in the paddle boats amuse themselves. When the lock opened up, this time it was completely full, they even had to turn the last boat away. 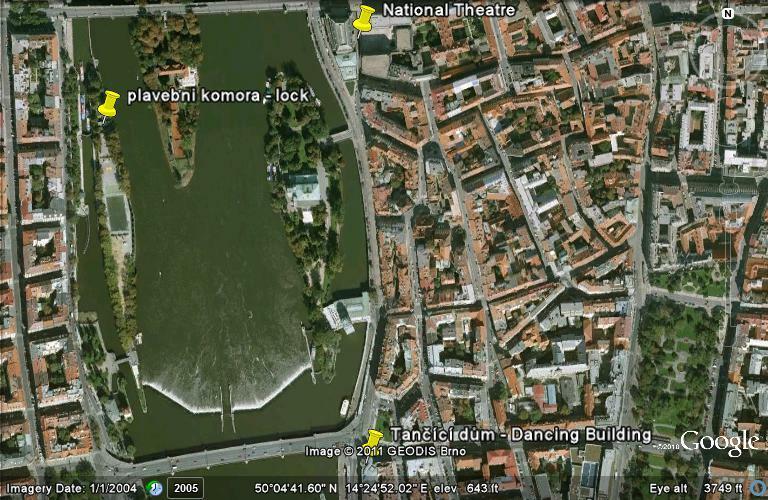 This particular lock is the busiest in central europe, mostly due to the fleets of tourist boats navigating this section of the river. When the lock fills, it’s a kinda eerie experience to know that you are locked in this giant bathtub full of huge steamers.. but it’s all good and pretty gentle, as all the ships are tied off. Waiting on the lock – low side on left, high side on right! There is no shortage of public art in Prague, and there are many excellent and thought provoking installations throughout the city. This permanent art installation at the Kampa Museum is located right across the lock chamber and I thought the lined up que an appropriate analogy while I waited my own turn to pass through! Incidentally, these Penguins light up at night and were made from recycled bottles recovered from landfills! 34 yellow lighted Penguins by the Cracking Art Group . The lock opening and emptying of water. Note that I am inside a little cove here which kept me out of the strong currents! This steamer boat was the first out of the gate! 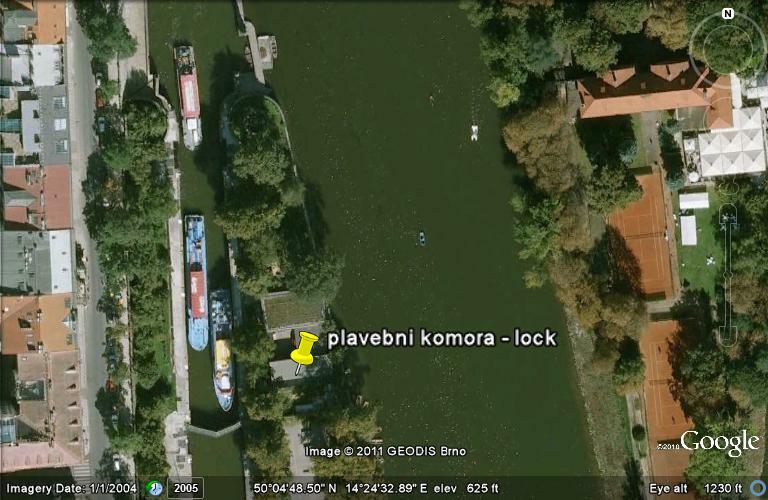 River traffic building up – this is the busiest river lock in central Europe! Inside the river lock gate and the gates are now CLOSED! After this, I hurried back, as I was already late to return my rental kayak, due to the lock fiasco, and made excellent time. Skies cleared up some, and I got my workout! Having worked and been in similar situations myself doing kayak rentals, I offered a nice tip which was accepted and all was well! The Basilica of St Peter and St Paul is a prominent Gothic Prague landmark! Check out these great historical photographs of Vyšehrad and the surrounding area! Historic Vyšehrad on the hill overlooking the river. The floating dock put in at Vodácký Ráj. The put-in is located in a pretty wooded area at Císařská louka, located in Smíchov. All in all, an excellent paddle, save for waiting long time on the upstream lock. It would be nice if a real portage around the river lock chamber actually did exist and was made available for public use. 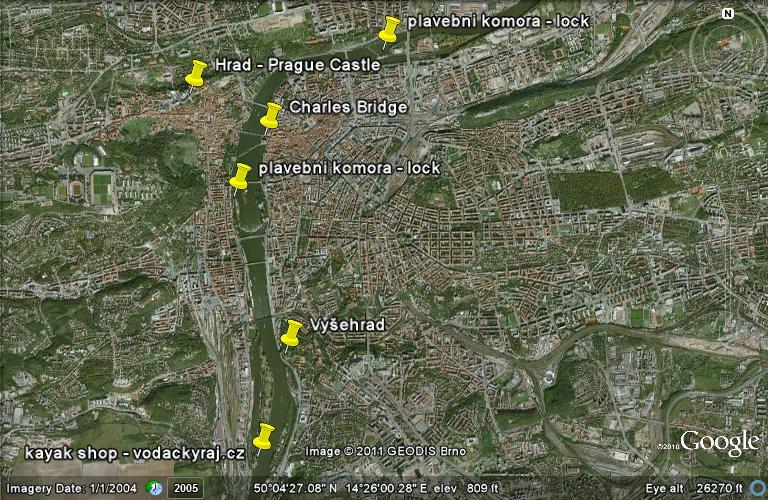 I won’t complain though as I got do to a really cool kayak trip in the heart of Prague! 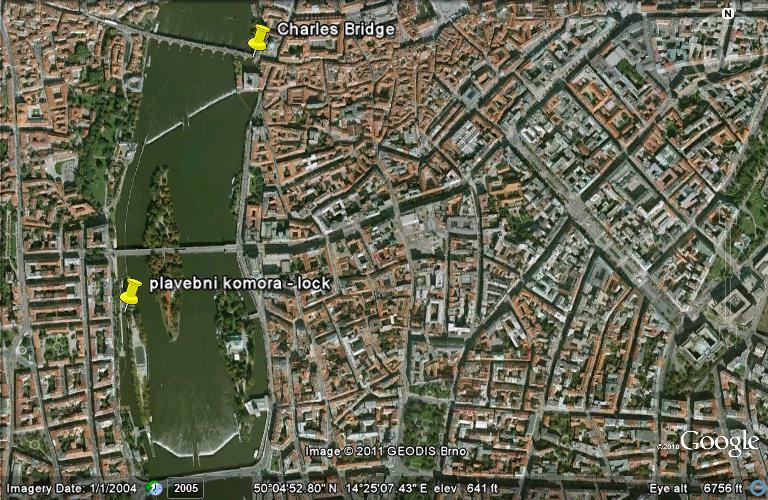 Satellite view of weirs and river lock near the Charles Bridge in Prague. Closeup of weir and lock next to the National Theater. Satellite detail of lock chamber (on left). © 2011-2016 Flex Maslan / kayakfari.com / digital029art.com. All original photographs, artworks and music in this portfolio are copyrighted and owned by the artist, Flex Maslan, unless otherwise noted. Any reproduction, modification, publication, transmission, transfer, or exploitation of any of the content, for personal or commercial use, whether in whole or in part, without written permission from the artist is strictly prohibited. Heavy paddle indeed. Missed having your greenland stick, I’ll bet 🙂 Thanks for sharing.